Because How You Live Is As Important As Where You Live. Located in the recently-developed White Stone Station neighborhood, The Junction Apartments offers contemporary 1, 2, and 3 bedroom apartment homes. With an address you will love, dreamy amenities, and a management team you can count on, our community reflects all that is White Stone Station. We pay attention to every detail, so you can focus on what is important to you! Dining and shopping options such as Costco, Grate Mac and Cheese, and HomeGoods are just outside your front door. 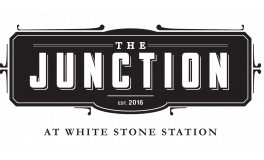 Whether you're staying in or going out, you'll be happy you chose The Junction at White Stone Station. Off-Leash Dog Park Now Available! Finding your new home is easy. Just give us a call or send us a message, we'll handle the rest.